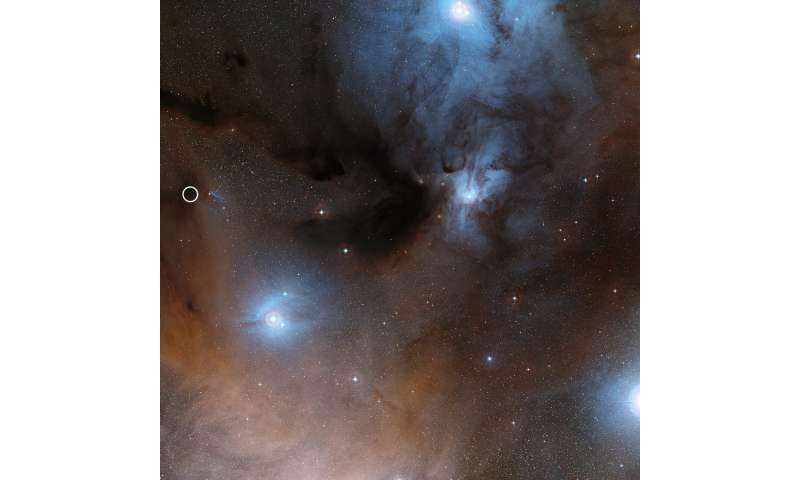 This warm and dense region contains young stars at the earliest stage of their evolution surrounded by a cocoon of dust and gas—similar conditions to those when our Solar System formed. 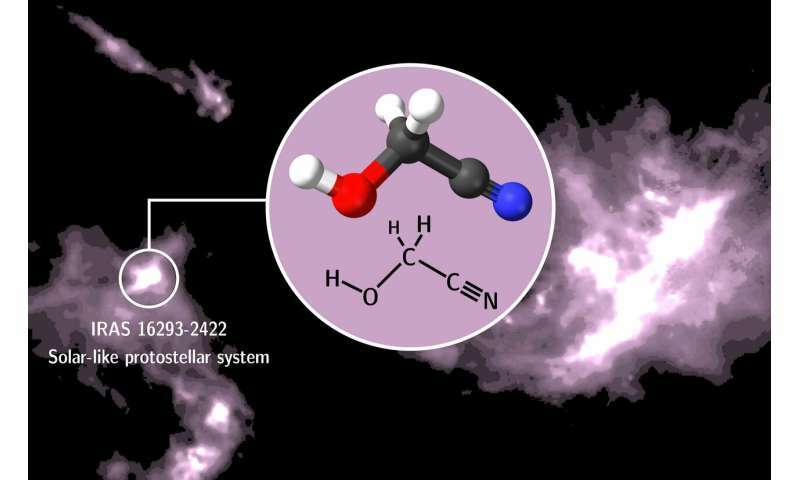 The researchers used data from the Atacama Large Millimeter/submillimetre Array (ALMA) telescope in Chile to uncover evidence for the presence of glycolonitrile in the material from which the star is forming—known as the interstellar medium. This follows the earlier detection of methyl isocyanate in the same object by researchers from Queen Mary. Methyl isocyanate is what is known as an isomer of glycolonitrile—it is made up of the same atoms but in a slightly different arrangement, meaning it has different chemical properties. Lol, no one knows when or where the emergence of life originated in the whole of the universe so that pretty much debunks the whole articles premise. so "water-seller", I'm uncertain whether or not you had made any effort to actually attempt to read the article or the papers it was based on? Or just leaped to a foolish conclusion straight off the headline? Cause of course pop-science headlines are never inaccurate hyperbole.... Right? My conclusion based on your comments? Or your comments based on a basic ignorance of the science involved? there is organic chemistry. & there is biology. Which of these are you disputing? It is generally opinionated that life may have originated within the first billion years after the planet Earth assembled. There are claims that life began within a few hundred million years of the conglomeration. But I am still skeptical of those claims. There is a maddenly obtuse overlap between pre-organic complexes & actual organic meta-complexity with self-replication. So, do you dispute that life originated somewhere in space? ... How did you type your comment if you are not alive? Which part of the word 'could' in the heading of the article don't you understand? While we may never know how exactly life on Earth got started we can do simulations on how it could have gotten started. Then, based on actual observation of how common the necessary building blocks are, we can get a good idea of how likely it is that life started in way X or way Y. ...which in turn can give us an idea how (un)common life is in the universe. a_p, I doubt that life began in space. I will concede there is plenty of evidence, chemical activities up to pre-organic chemistry, are heavily distributed throughout the observed Universe. I do think it still needs to be proven & verified, that the complexity of biology can be sustained, thrive & prevail in in the harsh environment off Earth. There may be a plentiful supply of pre-organic chemicals everywhere. Doesn't mean that local conditions would certainly result in the development of biology. A speculative of what could of been our Solar System. The conglomerating Earth planetoid consisted of an enormity of nickel-iron. Those metals & associated elements such as the varieties of Phosphorous, are now the planetary core. Encased in a crust of lighter elements, since the Hadean. Phosphorous found with iron-nickel space debris has been randomly raining down. Infusing the Earth's crust, for billions of years. If our Solar System lacked nickel-iron asteroids since the Hadean Epoch? The Earth's crust would be deprived of those Phosphorous elements. & the Earth would be a lifeless water world. Another possibility? The original chaotic planetesimal disk? Sorted out an abundance of nickel-iron with extra phosphorous. Depriving the other other planetesimals of sharing the bounty? A possible explanation for the failures of Mars & Venus.